I unfortunately have some bad news. As of 6/30/2016 Purple has decided to discontinue their coupon and promo code offers. However, there is a silver lining. Purple has been having fairly regular combo sales or offering other freebies with purchase. 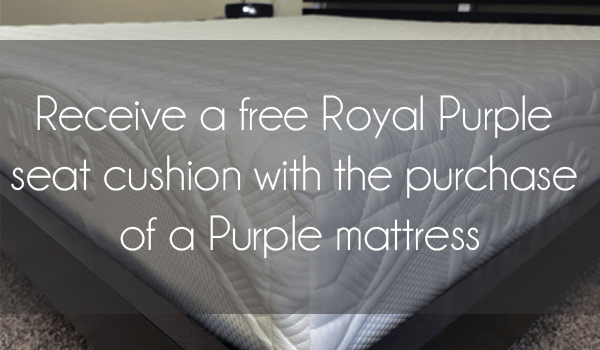 Currently Purple is offering some FREE sheets when you also purchase a Purple mattress. Click here to grab that offer. As of April 14th, 2019, this offer is active. There is no expiration, but if I had to guess I would say it will be active for a few months at most. I would also guess they may have something similar (perhaps a free Purple pillow) coming up in the future. I will update this page with Purple pillow promo codes and coupons as well (currently there are none). Regarding other promo codes, since the summer of 2016 I haven’t seen Purple offer many promos or other special discounts. During Black Friday / Cyber Monday 2016 they did have a special bonus offer for free Purple sheets when you purchased a mattress, which I would expect them to do something similar for Black Friday / Cyber Monday again this year. However, I doubt they will offer any other promo codes or discounts elsewhere during the year. Want to see the other coupons and promo codes on Sleepopolis? Check out the Sleepopolis mattress and sleep accessories coupon page for more discounts and special offers. Are you a fan of receiving free products when making your next mattress purchase? Sleepopolis sure is! With a little help from us, you could land a brand new Royal Purple seat cushion ($109 value) for free in no time at all. It’s a completely pain free process. Receive a new Royal Purple seat cushion for free!